High efficiency DC/AC power converter for renewable energy applications. 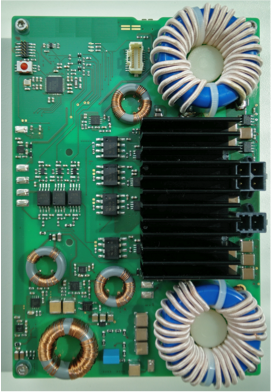 As one part of the Green PE project, a novel DC/AC converter is designed to show the potential of power electronics-based solutions and to overcome prejudices which new, innovative developments often face when introduced into the market. The continuous increase in renewable energy participation requires new converter topologies with increased output power and power density. One major development is the integration of a 3-level topology, where separate power inverters are used to switch the positive and negative half wave of the generated AC output. This lowers the required maximum voltage of each single power device and therefore, reduces costs. The second innovation is the introduction of a zero voltage switching concept – an observer circuit and a feedback controller enable the power converter to switch at zero voltage depending on operating points. This reduces the switching losses, especially at light load conditions and increases the conversion efficiency remarkably. With this improvement, the internal heat dissipation is minimised to a level where passive cooling concepts are now suitable for the considered application. The entire setup becomes more compact, robust and reliable. Another possibility to scale down the dimensions of the DC/AC power converter is to increase the switching frequencies to a range of a few 100 kHz. As a result, the size of all space consuming inductors reduces in the same way as switching frequencies increase. The implementation of the technical improvements enables the pilot demonstrator to be tested for whether a size reduction and an improved assembly leads to a better reliability. Additionally, it shows if the reduced heat dissipation and higher power density opens new markets and if new applications are addressable by reduced power losses at light load. The demonstrator is presented at fair activities to target groups, especially consisting of company branches from the wind turbine manufactures, solar inverter companies as well as small and medium-sized enterprises.